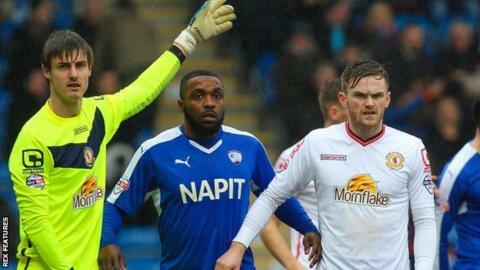 Two early goals gave Chesterfield the initiative as they won the battle of League One strugglers against Crewe. Sylvan Ebanks-Blake's shot hit both posts before going in, then Lee Novak doubled the home lead on 12 minutes, side-footing in from six yards. Callum Saunders went close before Zoumana Bakayogo replied for Crewe, scoring from Brad Inman's cut-back. Connor Dimaio sealed Chesterfield's win just before the hour following a neat one-two with Ebanks-Blake. Chesterfield's first victory in six games lifts them to 19th in the table, one point clear of the relegation zone and six above second-from-bottom Crewe, who suffered a first defeat in seven games. "Now we have to go again. We have been on a great little run. We'd have liked to have won one or two of them along the way but it has shown what we are capable of. "We played some terrific football at times and had enough chances to have got something. I thought the better team lost. "What we didn't do well was defend. We gave them gifts for the goals and those individual errors have proved costly. The full-back slipped for the first. then we didn't pick up at the far post properly and, for the third one, we didn't track the runner." Match ends, Chesterfield 3, Crewe Alexandra 1. Second Half ends, Chesterfield 3, Crewe Alexandra 1. Emmanuel Dieseruvwe (Chesterfield) wins a free kick in the attacking half. Attempt missed. Marcus Haber (Crewe Alexandra) header from the centre of the box is close, but misses to the right. Jon Guthrie (Crewe Alexandra) is shown the yellow card for a bad foul. Corner, Crewe Alexandra. Conceded by Declan John. Attempt missed. Semi Ajayi (Crewe Alexandra) right footed shot from outside the box misses to the right. Corner, Crewe Alexandra. Conceded by Tom Anderson. Attempt saved. Charlie Kirk (Crewe Alexandra) right footed shot from outside the box is saved in the centre of the goal. Attempt saved. Oliver Turton (Crewe Alexandra) right footed shot from the centre of the box is saved in the centre of the goal. Attempt missed. Oliver Banks (Chesterfield) right footed shot from outside the box misses to the right. Corner, Chesterfield. Conceded by Semi Ajayi. Corner, Crewe Alexandra. Conceded by Thomas Lee. Attempt saved. Marcus Haber (Crewe Alexandra) right footed shot from the right side of the box is saved in the bottom left corner. Attempt missed. Bradden Inman (Crewe Alexandra) right footed shot from outside the box is just a bit too high. Attempt saved. Sylvan Ebanks-Blake (Chesterfield) right footed shot from outside the box is saved in the centre of the goal. Attempt missed. Oliver Turton (Crewe Alexandra) right footed shot from outside the box is too high. Substitution, Crewe Alexandra. Callum Ainley replaces Zoumana Bakayogo. Attempt saved. Oliver Banks (Chesterfield) right footed shot from more than 35 yards is saved in the top centre of the goal. James Jones (Crewe Alexandra) wins a free kick in the defensive half. Substitution, Crewe Alexandra. Charlie Kirk replaces Callum Saunders. Goal! Chesterfield 3, Crewe Alexandra 1. Connor Dimaio (Chesterfield) right footed shot from the right side of the box to the bottom left corner. Assisted by Sylvan Ebanks-Blake. Attempt missed. Semi Ajayi (Crewe Alexandra) header from the centre of the box is just a bit too high following a set piece situation. Foul by Connor Dimaio (Chesterfield). Corner, Chesterfield. Conceded by Zoumana Bakayogo. Ben Nugent (Crewe Alexandra) wins a free kick on the left wing. Second Half begins Chesterfield 2, Crewe Alexandra 1. First Half ends, Chesterfield 2, Crewe Alexandra 1. Corner, Crewe Alexandra. Conceded by Drew Talbot. Corner, Chesterfield. Conceded by Oliver Turton.